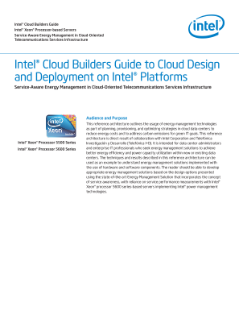 This reference architecture outlines the usage of energy management technologies as part of planning, provisioning, and optimizing strategies in cloud data centers to reduce energy costs and to address carbon emissions for green IT goals. This reference architecture is direct result of collaboration with Intel Corporation and Telefónica Investigación y Desarrollo (Telefónica I+D). It is intended ...for data center administrators and enterprise IT professionals who seek energy management solutions to achieve better energy efficiency and power capacity utilization within new or existing data centers. The techniques and results described in this reference architecture can be used as an example to understand energy management solutions implemented with the use of hardware and software components. The reader should be able to develop appropriate energy management solutions based on the design options presented using the state-of-the-art Energy Management Solution that incorporates the concept of service awareness, with reliance on service performance measurements with Intel® Xeon® processor 5600 series-based servers implementing Intel® power management technologies. Mike Blalock, GM Financial Services, Intel, discusses the main drivers within the Financial Service Industry, the recent changes, what changes are still to come and how this will affect the industry. Kyle Thomas, Head of Worldwide Sales, Saffron Technology, Intel, discusses why financial institutions need to invest in AI and how it has the power to transform the industry. Jim Robinson and Ray Almgren discuss collaborations to drive industrial transformation and insight.